Karuna Buddhist Vihara (KBV) was founded in 2012 as a neighborhood Theravada Buddhist monastery for bhikkhunis, formally incorporated as a non-profit Buddhist church in the state of California. Currently, there are two residents: Santussika Bhikkhuni and Cittananda Bhikkhuni. Ayya Santussika entered monastic life as an anagarika (eight-precept nun) in 2005, then ordained as a samaneri (ten-precept nun) in 2010 and a bhikkhuni (311 rules) in 2012 at Dharma Vijaya Buddhist Vihara in Los Angeles. She has trained in large and small communities of nuns, including Amaravati and Chithurst monasteries of the Ajahn Chah tradition in England. Ayya Santussika was born in Illinois in 1954 and grew up on a farm in Indiana. While being a single mother, she received BS and MS degrees in computer science. She worked as a software designer and developer for fifteen years in the Bay Area. Her search for deeper meaning and ways to be of service led her to train as an interfaith minister in a four-year seminary program that culminated in an Masters of Divinity degree. She began traveling in Asia in 1999, learning from master teachers, particularly in Thailand. It was these experiences, along with time spent at Abhayagiri Buddhist Monastery in California that caused her faith to develop to the point of choosing to live and practice as a Theravadan nun. ​Ayya Cittananda has spent over ten years on the Buddhist path, after being inspired in 2005 by a college philosophy class to spend time practicing at monasteries. After completing a Bachelor’s of Science in Nursing and working at a hospital as a registered nurse in Texas, she lived as a monastic at a small Pure Land/Chan monastery in Florida for a year before moving to California. She spent two years living and working in Redwood Valley, made daily visits to Abhayagiri Buddhist Monastery, and sat several long retreats at various monasteries and meditation centers. She left Redwood Valley in 2013 in search of a place to ordain as a Theravadan nun, spending six months at the Ajahn Chah lineage monasteries in England and Scotland. She also spent seven months at Aloka Vihara in Placerville, helping the nuns settle into their new home and serving the 2015 Winter Retreat there. Ayya Cittananda took Anagarika precepts at KBV in March of 2015, Samaneri ordination in April of 2016, and Bhikkhuni ordination in May of 2018 at Buddhi Vihara in Santa Clara, California. Walpola Piyananda, Ph.D. was born in Sri Lanka in 1943 and ordained as a novice monk at the age of 12. He earned his B.A. degree from Kaleniya University in Sri Lanka. He earned an M.A. from Calcutta University and another M.A. degree from Northwestern University. Bhante Piyananda earned two Ph.D.s, one from UCLA and another from the College of Buddhist Studies. He is the founder and abbot of Dharma Vijaya Buddhist Vihara in Los Angeles, California. It is one of the first Buddhist temples in the U.S. He has been in service to the Dhamma for many decades, teaching among the Sri Lankan and American born communities in the Los Angeles area. He has also trained and help found many other Dhamma centers and viharas around the U.S. Several temples in other states are affiliated with Dharma Vijaya being the parent temple. Bhante Piyananda has been instrumental in the re-establishment of the bhikkhuni Order. He was there with the planning and work as a Preceptor in 1996 in Sarnath, India when the first group of women in modern times became fully ordained nuns. Since then he has ordained many more women as fully ordained bhikkhunis, including Ayya Santussika in October 2012. Bhikkhu Bodhi is an American Buddhist monk originally from New York City. He obtained a PhD in philosophy from Claremont Graduate School in 1972. In late 1972, he received monastic ordination in Sri Lanka, where he lived for over twenty years. He was the editor for the Buddhist Publication Society in Kandy, Sri Lanka from 1984 until 2002. Ven. Bodhi has many important publications to his credit either as author, translator, or editor, most recently a translation of the entire Anguttara Nikaya, and the Sutta Nipāta and its commentaries. In 2002 he returned to the U.S. He now resides at Chuang Yen Monastery near Carmel, NY, and is the Chairman of the charity Buddhist Global Relief which tirelessly works to help the most desperate and starving people in the world. 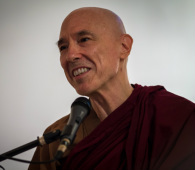 Venerable Bhikkhu Bodhi's support of KBV and role as an advisor has been invaluable. A Sri Lankan by birth, Bhikkhuni Sudinna was ordained as a samaneri in 1999 by Bhante Gunaratana at the Bhavana Society. She received the higher ordination (Upasampada) in 2002 in Sri Lanka. In lay life, Ayya Sudinna served as a teacher in Government schools and as a lecturer in English at the Government Teachers Training College, Maharagama, and later under the Higher Education Ministry in Sri Lanka. She has an honours degree in English and an M.A. in Buddhist philosophy. She is the author of three children’s story books titled ‘Delightful Tales’, 'Precious Tales I', and 'Precious Tales II'. Ayya Sudinna is the bhikkhuni preceptor for KBV as well as an advisor. Ayya Anandabodhi first encountered the Buddha’s teaching in her early teens, which ignited a deep interest in the Buddha’s Path of Awakening. She has practiced meditation since 1989, and lived in Amaravati and Chithurst monasteries in the UK from 1992 for 18 years. In 2009 she moved to the U.S. on invitation of the Saranaloka Foundation, to help establish Aloka Vihara, a training monastery for women, where she now resides.She took leave of the Ajahn Chah lineage in 2011, in order to take full bhikkhuni ordination. The teachings and example of Ajahn Chah continue to be an influence and inspiration in her practice and teaching. Ayya Santacitta was born in Austria and has a multifaceted background in hotel management, cultural anthropology and avant-garde dance theatre. Her first teacher was Ajahn Buddhadasa, who sparked her interest in Buddhist monastic life. She has practiced meditation for over 25 years and trained as a nun in both the East and West since 1993, primarily in the lineage of Ajahn Chah. Since meeting Shechen Rabjam Rinpoche in 2002, she also integrates Dzogchen teachings into her practice.Ayya Santacitta is co-founder of Aloka Vihara, where she resides since 2009 and received bhikkhuni ordination in 2011. She is particularly interested in learning from nature and bringing faith traditions to the climate movement.